In one of my SharePoint implementation, Defined the governance policy for versioning as: "Only 5 Major and 5 Minor versions should be kept.". So placed that in End user self service Portal site. But who cares? users setup up their document libraries/Lists to unlimited number of versions, and asking for Increasing the Site quota quite often. On analyzing the site space figured out: For a 1GB site, versions are occupying nearly 300MB!!! So, wanted to clean-up the versions except last 5 minor/Last 5 Major. Oh, Yeah, to set versioning limit in SharePoint, Just get into the List/Library settings > Versioning settings then setup the versioning limits. Quite simple, Isn't it? Ah, but user has 100+ libraries where unlimited number of versions enabled! OMG!!! PowerShell comes to rescue again! Here is the code to delete the older versions, except last 5 major and minor. 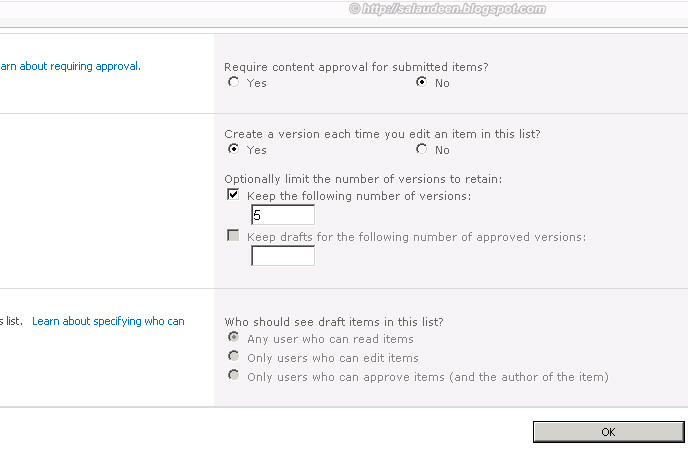 How to Disable Versioning in a SharePoint List? Ok, What about cleaning the Old versions? I have set-upped versioning limits, Will it delete the older version beyond my limit? unfortunately "NO"
Say for e.g. I've a Document in Document Library with unlimited number of versions turned ON, Where the document has 20 versions. So, If I Set the versioning limit to 5, will it delete the Older 15 versions and Keep only the last 5? NO NO NO, Until we create a new document or edit the existing document, those versioning limits will not be applicable. This new limit will not affect the existing old version. We need to Delete them explicitly. Take a Look at this task list, where I've limited the versions NOW to 3, But it has existing older versions! So, To clean up the existing versions, Lets seek help from PowerShell again! Let the PowerShell delete older versions. 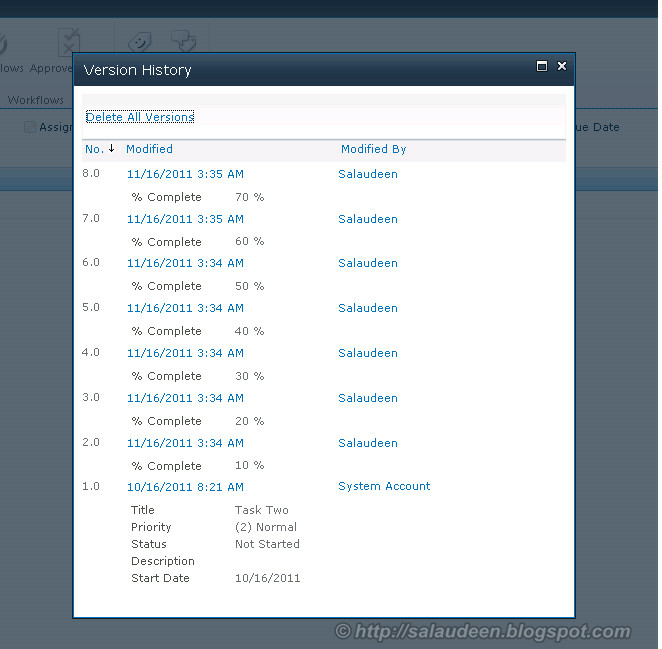 Alternatively, You can perform an empty update in list items to apply new versioning limit and cleanup older versions. How will be the script for minor versions? You can set List.EnableMinorVersions and list.MajorWithMinorVersionsLimit properties. For instance, if there are 20 versions and you want to keep 5 this would start with version 15 and delete older versions (lower number versions) through version 1. It seems the line you used would delete all but the oldest 5. Am I reading it wrongly? The above code aims to keep the latest versions and delete the old one. Versions are stored as First-in-first-out. When I try to delete old versions, getting the below error. Any idea. Had to tweek a couple of things, but this saved me days of work. Thanks a bunch! Is there a table or list where the version information is stored and if so do you know the URL?